A novelty at Denver 2017. Aggregate of very sharp Jouravskite crystals, a very rare calcium and manganese sulfate-carbonate. 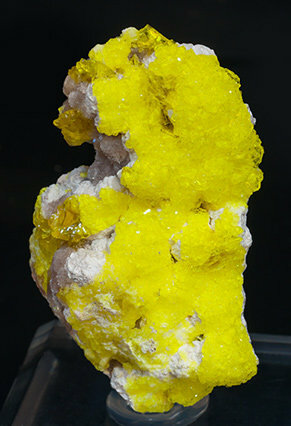 The crystals, on a rocky matrix with Quartz, apart their excellent luster, have and an extraordinary lemon-yellow color. A novelty at Denver 2017. 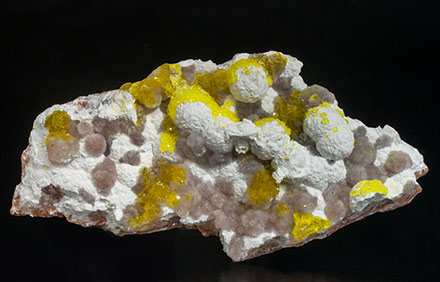 Botryoidal aggregates of Jouravskite micro-crystals, a very rare calcium and manganese sulfate-carbonate. They are very sharp, very bright, have and an extraordinary lemon-yellow color and are on a Xonotlite matrix. A novelty at Denver 2017. Very well defined lenticular Jouravskite crystals, a very rare calcium and manganese sulfate-carbonate. 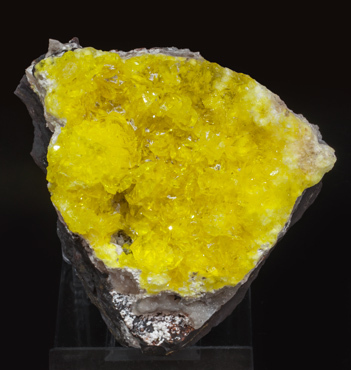 They are translucent, very bright, with an extraordinary lemon-yellow color and on matrix, with white Xonotlite aggregates and translucent botryoidal Hydroxyapophyllite-(K) aggregates with a lavender color.